Farm Cakes - Birthday cakes decorators Long Island New York. Our farm cakes are a favorite among Long Island clients. This is complete with a two tiers including a cowgirl birthday theme. The farmer’s daughter enjoyed eating this cake as much as we enjoyed making it. Our cakes are always fresh and always delicious. As most farm cakes should be designed we included a red cake barn on top that is completely edible. The barn is made with a golden yellow sponge cake and filled with layers of chocolate mousse filling. The bottom tier is a scrumptious chocolate cake with sweet vanilla buttercream frosting. 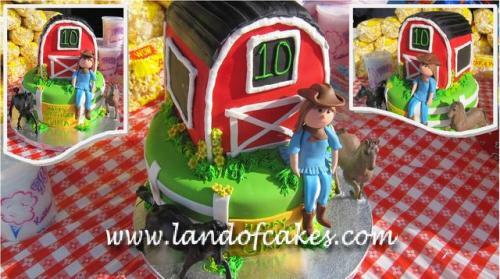 As a special request we added an edible fondant cowgirl which is sitting on top of this barn birthday cake. The outside the farm cake is made with a special flavored fondant frosting. It’s decorated to include a realistic barnyard fence wrapped completely around the cake. As seen on most typical farm cakes we also added a set of farm animals hence the horses surrounding this delicous treat. This particular client lives on a farm in East Hampton, New York. They designed this cake with ideas from one of our cowgirl birthday cakes. Their creativity helped bring another one of our custom specialty farm cakes to life.